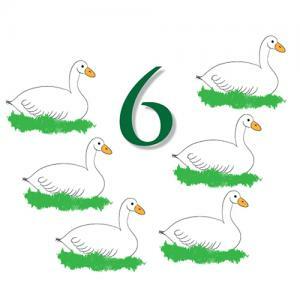 On the Sixth Day of Early Christmas We Didn’t Forget (Totally) to Talk about Music from the Lowlands! Yes, I know, at the end of the 4th day we said that on the 5th day we would talk about music from the Lowlands that was related to the German music of the 4th day. I put it off for a day because I really wanted to talk about smelly, odiferous odors on the 5th day. But here we are. The last few years, we’ve introduced several pieces by the Flemish composer Messaus and we’ve revived our famous Dutch carol. This year, we have but one piece from the Lowlands, a virtuosic choral work by Amsterdam composer Jan Pieterszoon Sweelinck, 1562-1621. He was known as the Orpheus of Amsterdam and he had a couple of other colorful nicknames as well. He was famous primarily as an organist, but he also excelled on the carillon and the harpsichord, and his improvisational skills were legendary. He was internationally renowned as a teacher of organists and was known as the “maker of organists.” He was especially important to German organists and was the teacher of virtually every important organist in the north German organ school of the 17th century, including Jacob Praetorius II, who was the son of Hieronymous Praetorius, one of the composers of our In dulci jubilo suite, the subject of the 4th day’s ramblings. And so it goes. There will be plenty of Dutch music in our April concert, Dutch Treat! Vasthouden! Je kunt het! Vrolijk kerstfeest! An Early Christmas in 7 days. Click to buy tickets for our Christmas concerts on Dec 11, 12, & 13!